House training for dogs doesn't have to be a stressful, complicated thing. Most new dog or puppy owners usually start house breaking from Day 1. But with so much information floating about online, not to mention the well-meaning advice from your neighbors and friends, it can get confusing to know which methods are the best. Questionable puddles and piles around the house, getting up six times a night to let your puppy outside, worrying about what you're going to come home to after leaving your dog alone for a few hours... these are all too common problems that new dog and puppy owners face. 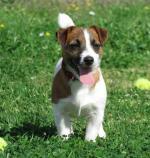 Are you looking for an easy way to house train your puppy or older dog? 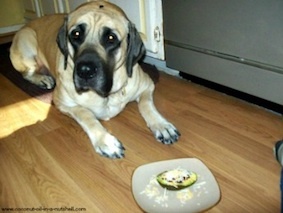 A tried-and-true method of house training for dogs that really works for all sizes, breeds, ages, and temperaments? Lucky for you, I've been there, done that with my own dog, as well as with many client's dogs, too! I've compiled all the house training knowledge I have into a 23-page guide to make it convenient for you to have everything you need in one book - no more hours spent at the search engines and clicking all over this site. How Did I Discover the Best and Easiest House Training Methods? When we took our puppy, Justice, home for the first time, she was used to being allowed to pee and poop all over the house. She hadn't been properly house trained (and she was already 2 or 3 months old! ), so the brunt of the work fell to me. It's not that she was dumb or a slow-learner; the previous owners simply didn't know to house train a dog. For the first week or so that we had Justice, house training didn't really go that well. I kept baby gates up to confine her in the kitchen so that the carpet wouldn't get ruined. At least I could mop the linoleum, right? The following week I started my dog training apprenticeship, and the first question I asked was how in the world do you house train a puppy! I mean, my mom's carpet depended on me figuring this out. Fortunately, I learned very quickly the right way to house train, and had Justice going accident-free by the end of the week. :) Phew! Over the next year of my dog training apprenticeship, I noticed that more dog owners struggled with this house training issue than I realized. We toilet train our kids no problem (well, without too many problems, usually), but when it comes to our dogs, we more often than not fail. Or at least, barely squeak by. I want to change that. You don't have to be stressed out because of house training trouble! I've spent hours putting all the knowledge I have about house training for dogs into an easy-to-follow guide for you. trick with the bell, a great idea! to anyone wanting a well trained pup! 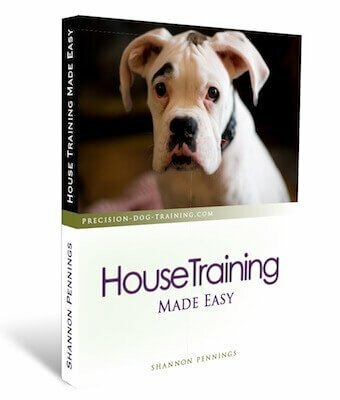 While there is a couple articles on this website about house training for dogs and crate training, this book contains much more detailed information and training tips. Of course, now you're wondering how much this great e-book is... only $2.99! To make it extra easy, you can pay with PayPal or credit card. And you can start training right away with instant access to your new e-book, no matter what time of day you purchase it. A must have for all new puppy owners! I plan on purchasing a copy for all my puppy families. This book is a quick, easy read and easy to apply these great training techniques in your home. Anyone considering a new puppy should read this book! Great book Shannon!! Lots of good advice, things that I tell people, but written really well. Not long and boring - perfect! An extra chapter on knowing the difference between marking and peeing. Many owners think that their dog has regressed in his house training, when he is really marking in the house (not peeing). This bonus chapter digs into what the difference looks like, reasons behind marking as a behavioral problem, and proven solutions to get your dog to stop. To make things easy, I've included this resource as an extra chapter at the end of the book. But don't wait - you have nothing to lose by buying House Training Made Easy, and everything to lose by not! Maybe not everything, but definitely your carpet and your sanity. the Easy Way for just $2.99! When you consider that replacing stained carpet or ruined hardwood can cost upwards of $1000, this book really is worth it. It's way cheaper than having a professional dog trainer come to your home for private training and behavior modification, too. Most trainers charge around $50 an hour for a consultation (or more!). I'm certain that this book will give you the knowledge you need to get your puppy or older dog house trained with as little stress as possible. In fact, I guarantee it! If after reading and implementing the techniques in this book, you don't think that it made house training any easier... just let me know within 30 days of your purchase and I'll be happy to give you a full refund, no questions asked.